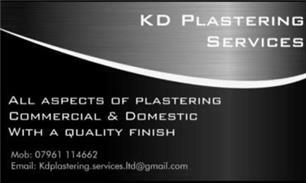 K D Plastering Services - Plasterer based in Hanham, Avon. A Professional Team That Provides Plastering needs including Rendering, Skimming and Plaster Boarding. Reliable and honest team giving you a guaranteed smooth finish. For a free quote please contact K D Plastering on 07961 114662.